I’m back! Sorry to have been gone for so long but needed to get away for some rest and relaxation which I rarely got during my trip to Chile but I couldn’t stop! There were so many beautiful places to see and great food to be had! 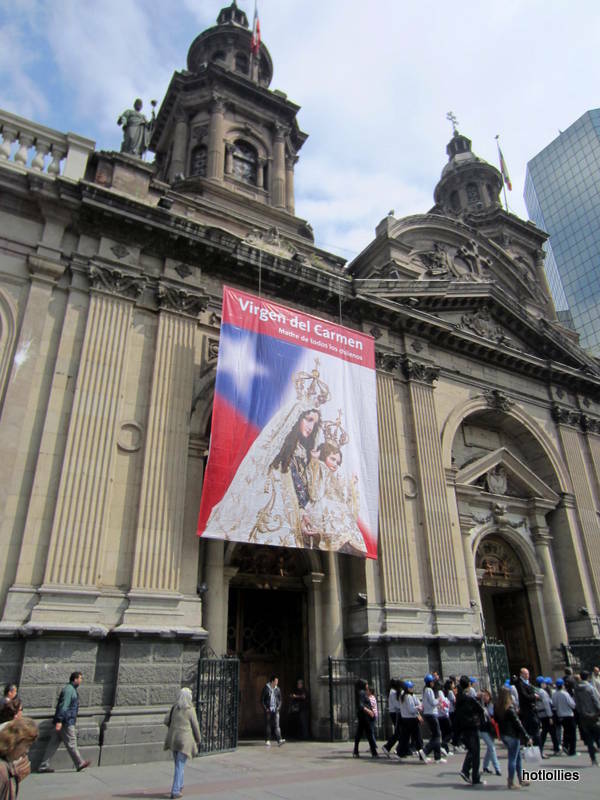 I had the pleasure of visiting both Chile and Argentina as well as the Patagonia area for my too short vacation and noted many great spots for my return visit. I think I gained about 5 pounds there but who cares, life is meant to be enjoyed! Besides, there’s nothing a little exercise can’t fix. 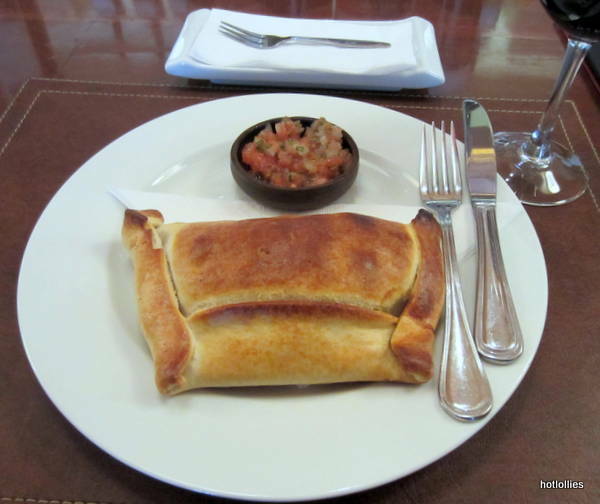 We landed in Chile first, the home of the Carmenere grape, Chilean Sea Bass, and some of the best steak empanadas you’ll ever have! 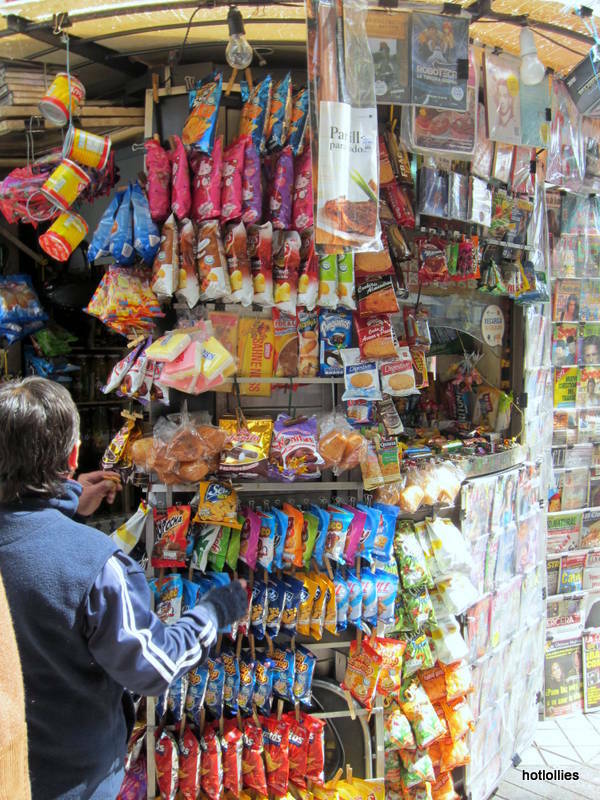 First though we took in a city tour of Santiago to get acclimated and all the while I was looking for something spicy to share with you! Anything to take away the chill in the air. This time of year is the beginning of Spring in this area and even though the flowers were blooming there was still a little cool air coming in from the Pacific ocean. We walked around enjoying the beautiful architecture. 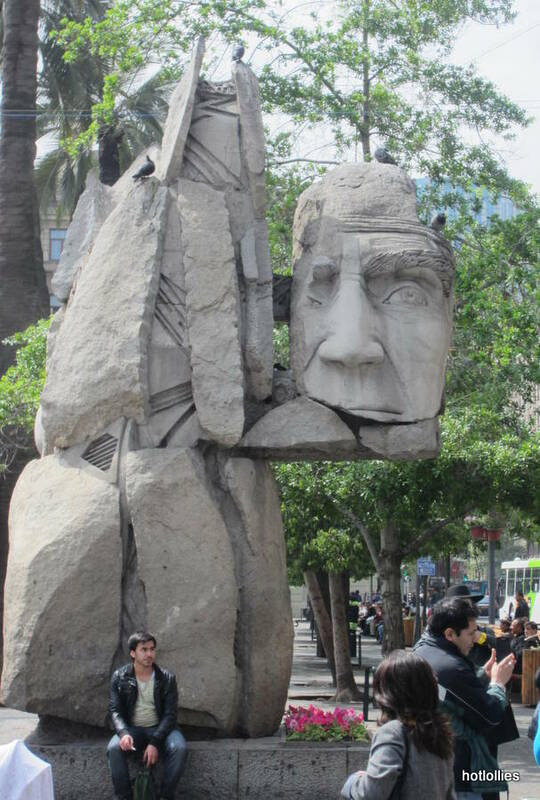 Chile has some great structures and you can clearly see the European influences. 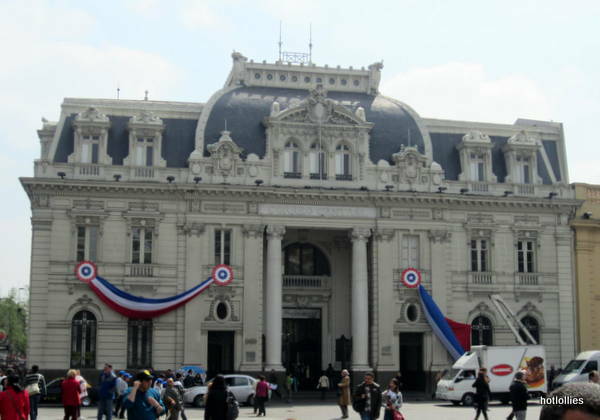 Below is Santiago’s post office in the Plaza de Armas, now does your post office look anything like that? 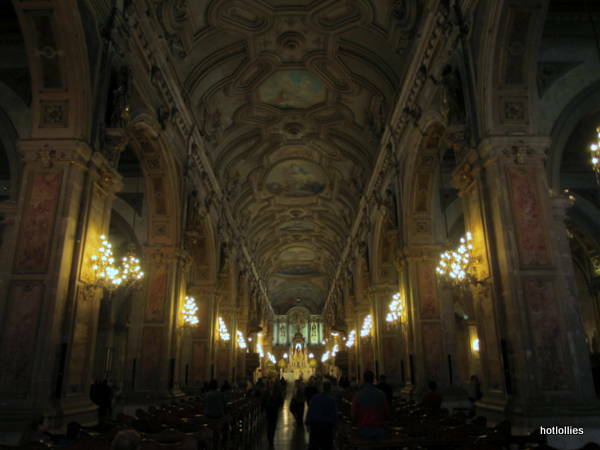 Probably not but also in this plaza you’ll find an Italian renaissance church, some art nouveau interiors, beautiful art sculptures, and artisans selling all sorts of goods…just watch out for the pushy older ladies selling rosaries, so cute but they won’t take no for an answer! 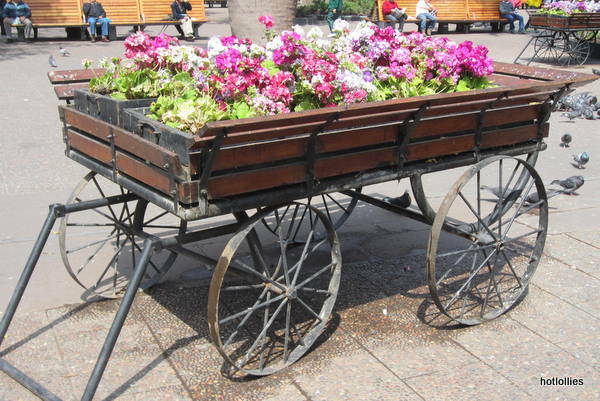 Loved this cart, so colorful and organized! I edited quite a bit here after taking over 800 photos between both countries so picked a few to give you a snapshot of what I experienced. I looked around for spicy foods of course but Chilean food is more flavorful than hot. Hot peppers are more of an afterthought and added as a garnish, worked into a salsa or dried and sprinkled on dishes. 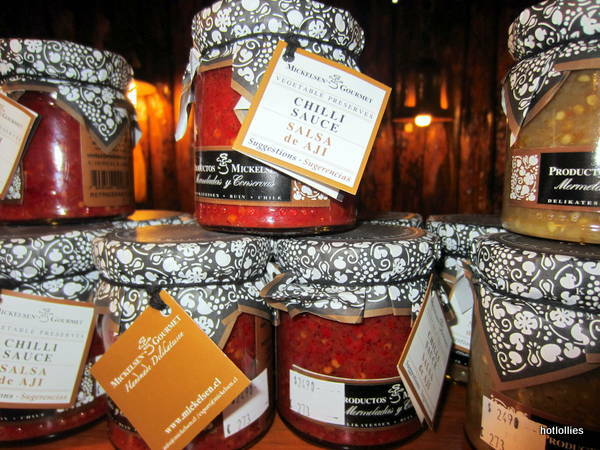 There aren’t any specific places that I found that focus on hot, spicy foods but pretty much any restaurant or market you visit will have local aji (pepper), preserves, salsas or dried spices for purchase or to add to your dish. 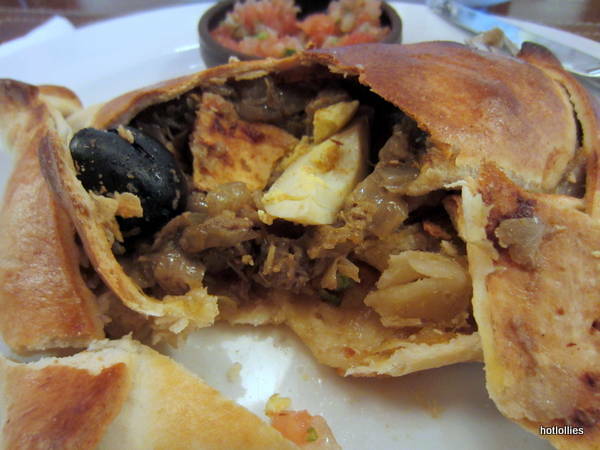 One thing you will get plenty of in Chile is the empanada (that’s a meat patty folks). Here the empanadas are very different from those I grew up on. The spices are different and most are stuffed with chopped boiled egg whites, olives, coarsely chopped onions and chopped steak, not ground beef which is typical in the Caribbean versions. All in all, very delicious and usually served with a spicy salsa on the side…oh, and most look like below, giant hot pockets or calzones! 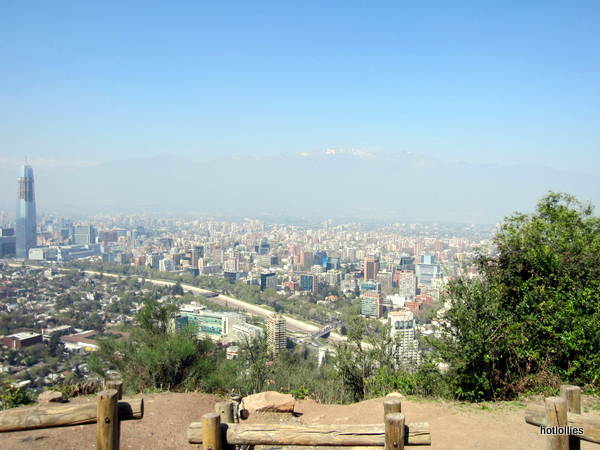 You’ll have some energy after your empanadas so take a drive up to the San Cristobal mountain for a hike and a panoramic view of Santiago. On a clear day you can see the snow capped Andes mountains in the distance. Definitely a view not to be missed! There was a bit of fog still covering the city when I took this photo but you can still see them. I could have spent hours up there, its just that peaceful. Further up the mountain you can hike to where the chapel is and just take it all in. Be sure to wear comfortable shoes or sneakers since there will be a lot of stairs and walking. 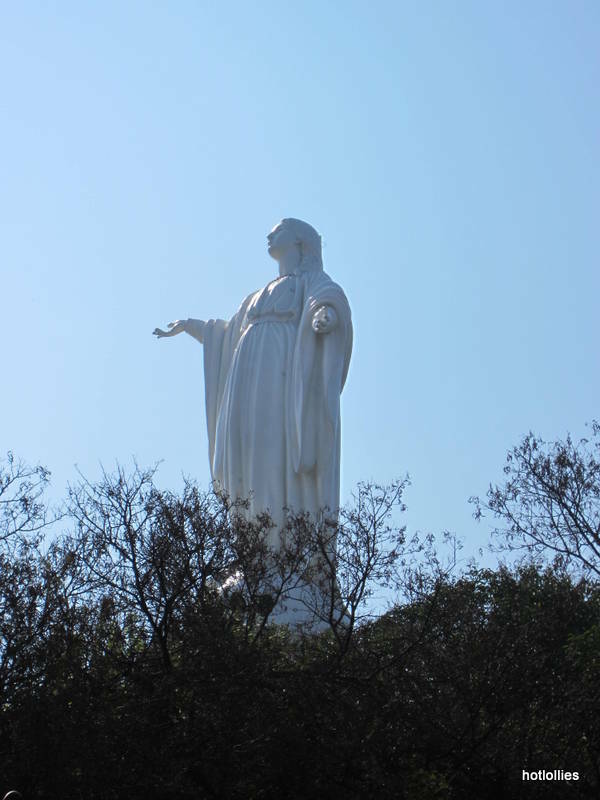 Once you approach the top you’ll find a huge 22 meter Virgin Mary with extended arms similar to the monument of Christ in Brazil. It’s was a nice relaxing tour after a day of activities but the day wasn’t over yet. We stopped by the Normandie restaurant in downtown Santiago after reading several great reviews online and the food was spot on! 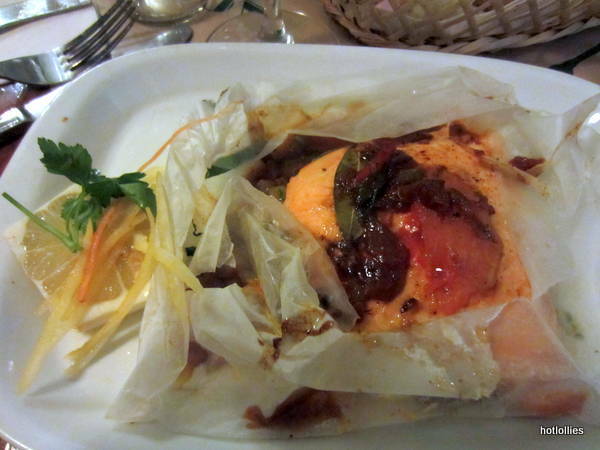 This salmon papillote was the most tender, well spiced salmon I had in all of Chile and there’s a whole lot of salmon to be had in Chile. 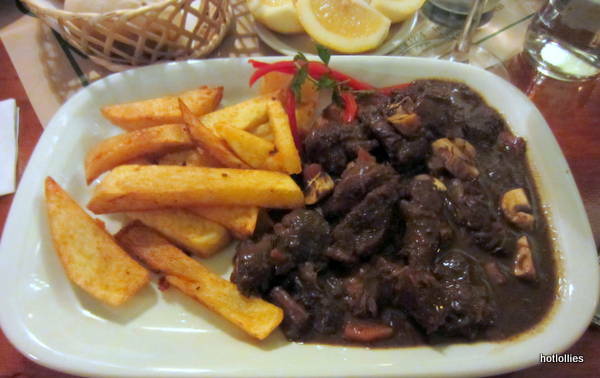 This beef bourguignon was like butter; tender, juicy and very satisfying. May I add too that the food prices were very reasonable here. The food prices in Chile can get very steep. You can’t visit Chile without touring a vineyard or two or three! Chile is a huge contender in the wine marketplace and their Concha y Toro vineyard is one of the largest wine distributors in the world. I’ve had just OK Chilean wine in the states but in Chile I had great, exceptional wine. Surely they’re keeping all the good stuff! Seemed like every wine we tried was good, even the table wine. There are many good vineyards around the Santiago area. 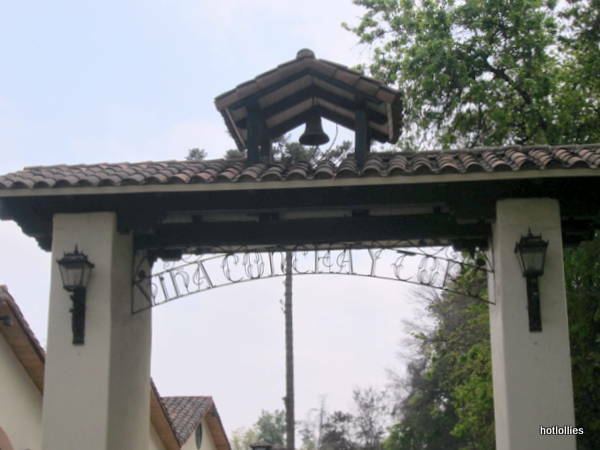 We took the metro (subway) to the Concha y Toro vineyard and it took us less than an hour after a quick 10 minute taxi ride from our train stop. 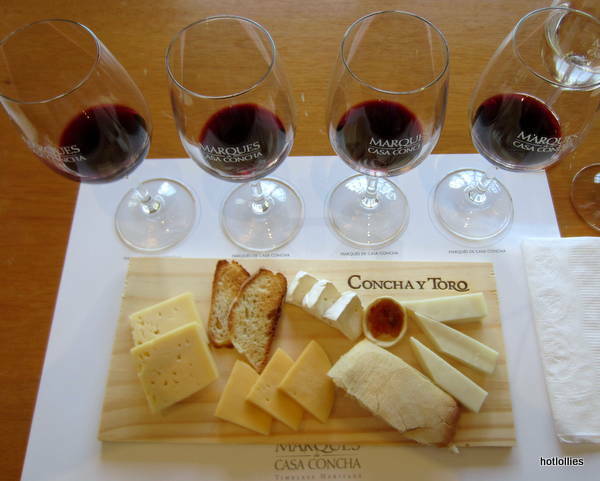 For only $36 you can tour the vineyard, visit the Castillero del Diablo cellar, enjoy an indoor and outdoor tasting, as well as a cheese plate and wine pairing with a sommelier…and you get to keep the cheese board and glass. 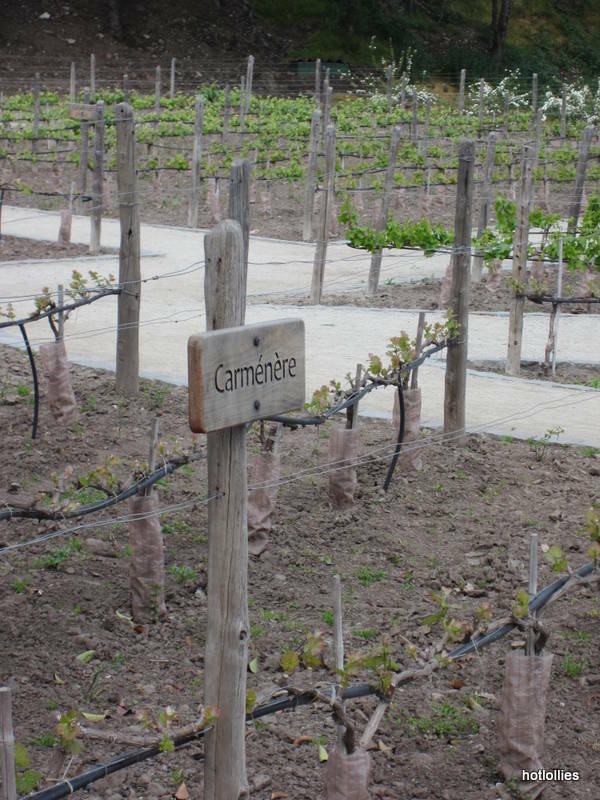 Below is the famed Carmenere grape responsible for one of the best and beloved medium bodied wines in the country. This harvest will be ready by February or March of next year. Another gorgeous vineyard you must visit is the Emiliana organic vineyard which is only about a half hour drive from Santiago. The grounds are gorgeous, the staff friendly and the wine is flowing! I picked up a bottle of their Chardonnay for a pleasing crisp and fruity white wine perfect for all the seafood you’ll be enjoying in Chile. After leaving Santiago, we headed south for Puerto Varas at the northern part of the Patagonia to commune with nature and indulge in the country’s fine seafood dishes. Soon I’ll post those photos for you!